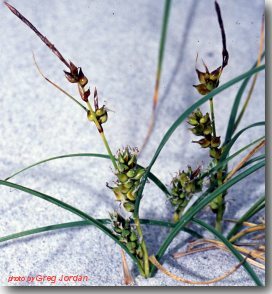 Sedge with tufts arising from creeping rhizomes, able to grow through accumulating sand, stems triangular in cross-section. On all Tasmanian coasts, and sometimes in inland sandy places, and on the edges of salt lagoons in the Midlands. Propagates easily by division or seed. Carex has been used successfully for direct seeding. Suitable below powerlines. Seeds are oval nuts, 2-3mm long, and released within 3-14 days of seed maturity. Cut stalks with secateurs to collect, place upside down in a bag to dry, rub between hands to extract all seed and sieve to clean.